So I teach them a simple method of multiplication which is not only easy to remember but saves a lot of time . Once you understand this method , the time taken to do two digit and three digit multiplication reduces by half. These methods are derived from Atharv Veda and they make calculations really simple. Multiply the digits at the tenth place . Add the digits to the carry over digits. This step is again called vertically . 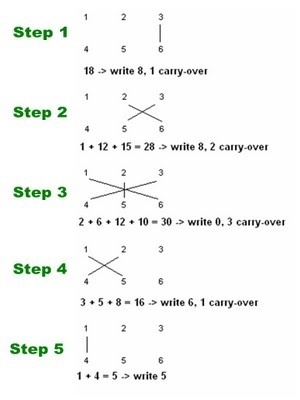 We multiplied 1 with 3 here and added the carry over 1 from step 2. Let us work another problem by placing the carried over digits under the first row and proceed. i) 3 X 6 = 18 : 8 is kept at the unit’s place and 1 is carried over to the next place value. iii) (1 X 6) + (3 X 4) + (2 X 5) = 6 + 12 + 10 = 28 ; 2, the carried over digit is placed below fourth digit. iv) (5 X 1) + ( 2 X 4) = 5 + 8 = 13; 1, the carried over digit is placed below fifth digit. 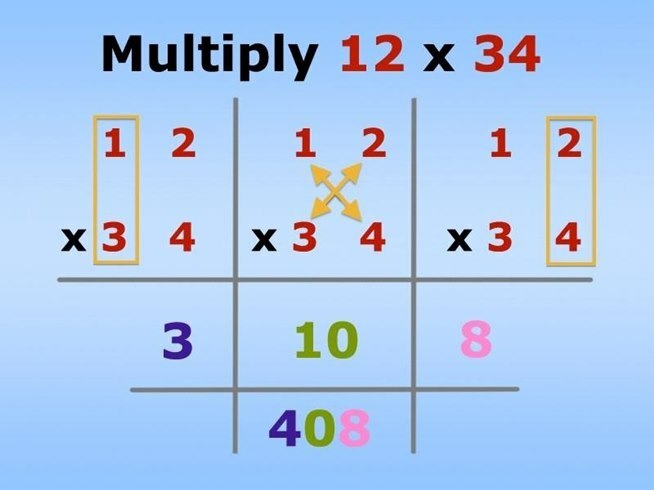 This method can be applied for any two digit or three digit multiplication and it reduces the time by half .